Malacanang has advised Vice President Leni Robredo to refrain from making statements that could lead to a confrontation between the Philippines and China. Spokesperson Salvador Panelo made the statement after Robredo lamented that the taho-throwing incident involving a Chinese woman was an insult to the Filipino people. The Vice President added that the incident should set off a “wake-up call” to the government not to give preferential treatment to Chinese workers. 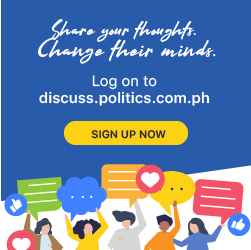 “Maybe it is a wake-up call to her to stop speculating and stop giving statements that may inflame incidents that need not be so,” said Panelo in a media briefing on Monday. The spokesman, however, reminded all foreign nationals in the Philippines to respect the laws and regulations of the host country. “Foreign nationals who sojourn in this country should always behave, otherwise, they are subject to laws and deportation. We will not allow them to disrespect authorities or violate any laws or ordinance in this country,” Panelo concluded.